For the first time in American history, the United States Mint and Treasury Department have put a black woman on money. 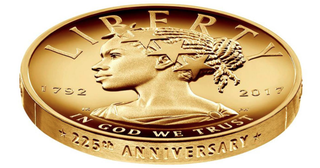 On Thursday the agencies unveiled the 2017 American Liberty High Relief Gold Coin, which portrays Lady Liberty as a woman of color. The coin is the first in a series of coins that will feature Lady Liberty as Asian American, Hispanic American and Native American and will be released every two years. They are collectors coins and will not be in circulation. While it was announced last year that Harriet Tubman would replace Andrew Jackson on the $20 bill, those bills have not yet been created.